The milling process is the controlled removal of asphalt or concrete pavement to a predetermined depth, slope and/or specified thickness. 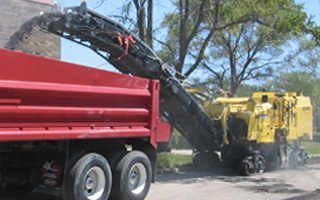 This process is often used to improve drainage flow and remove pavement irregularities. It is also used to remove deteriorated pavements for patching, overlaying or to re-establish proper profile for the existing and/ or new concrete curb and gutter. Edge Milling is the process of milling the asphalt areas directly adjacent concrete curbs, gutter pans and metal structures, such as manhole covers to a specified width and depth. We edge mill to tie into the elevations of the existing concrete and metal structures, asphalt is removed along the perimeter to allow proper depth of asphalt on the edge, but most importantly to preserve the appropriate drainage patterns on the asphalt surface. This process is referring to milling to a specified depth on the entire asphalt street and/or parking lot.